Brockley. Photo © David Secombe 1999. STAN: I’m from the South too. OLLIE: The south of what, sir? – Laurel and Hardy in Way Out West, 1936. 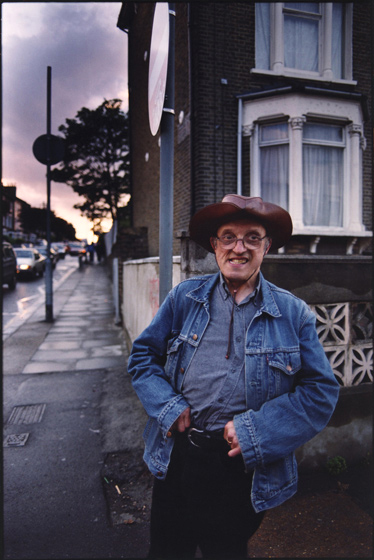 The Brockley Cowboy – I can’t tell you his name – has been a familiar figure on the streets of SE4 for many years. During all this time, his outfit has remained broadly the same: a ‘life on the range’ denim jacket, usually teamed with matching jeans – although not in this photo; a plastic cowboy hat and the occasional idiosyncratic accessories (a small tartan wheelie case was a featured item for a time). Occasionally, I would see him in the company of someone who appeared to be his carer, but more often than not I saw him alone, almost always smiling, restricting himself to just a few streets at the western end of the SE4 postcode. In this picture he is standing at the junction of Drakefell and Endwell Roads. I happened to be passing – I lived on Endwell Road – and asked him if I could take his photograph: he gestured his assent with an endearing largesse. It was as if these streets were his prairie, the evening flow of commuters and traffic as familiar and natural to him as cattle moving across the plains.